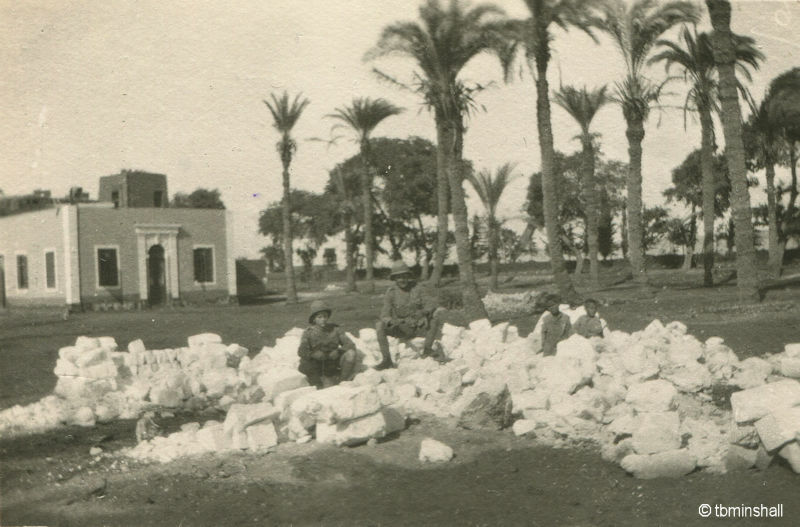 Cheshire Yeomanry arrived at Minia, some 150 miles south of Cairo, around 2:00am on 19 April 1916 – strength was 23 officers, 440 other ranks, 6 horses and 4 mules. 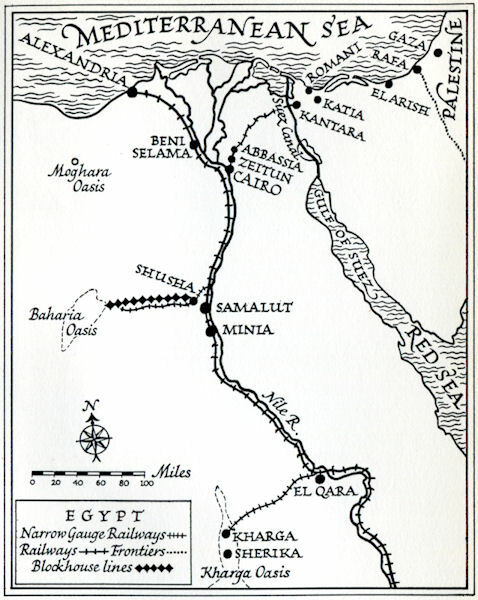 The Regiment had been sent to Minia to prepare for operations against the Senussi, a religious sect in Egypt, Sudan and Arabia, who were persuaded by Turkey to attack the British. 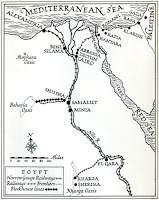 By June squadrons were being detached from headquarters, which remained at Minia until September 1916, to assist in operations associated with the capture and occupation of the Baharia Oasis. Some time, likely in April or May 1916, Corporal Thomas Minshall of “C” Squadron, Cheshire Yeomanry, gained permission to visit Minia. He later wrote the following notes for his wife Eva which describe the sights he saw. 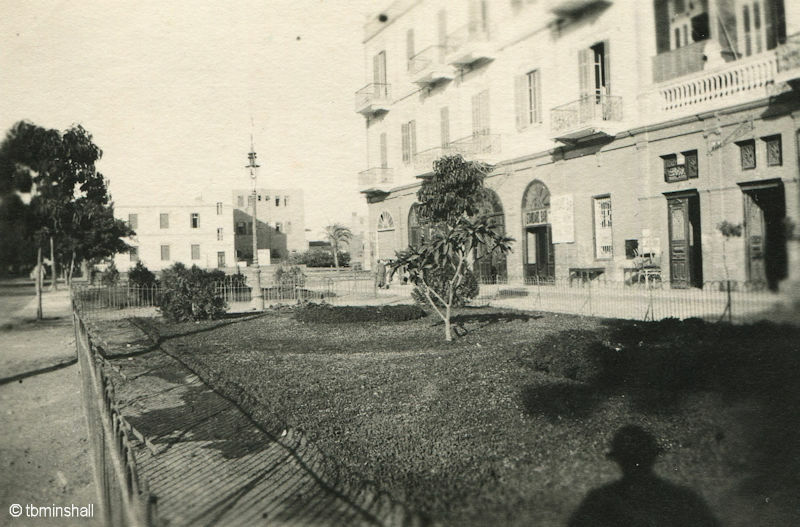 Sadly, the associated additional letters and drawings Thomas refers to have been lost during the last 100 years – however several photographs from this time survive and accompany the notes. 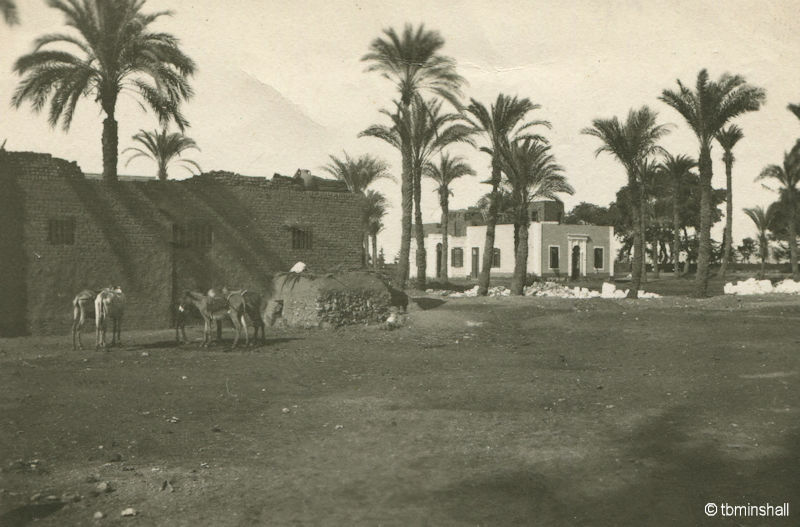 The first afternoon I obtained permission to visit Minieh (Minia) a town of about twenty thousand inhabitants, I naturally enquired for the most important streets. A native policeman directed me, and as I went along passing through what we would call, country lanes (but were side streets) I came into what appeared to me a third rate street. I walked about for some time, looking at the shops which were nearly all like the rough sketch I sent you, when I noticed above one “Swiss watchmaker, English Spoken”, so walked inside. I purchased a case to keep the sand and dust out of my watch, and asked him questions about the town. I was very much surprised when I learned I had been walking up and down the main street for some time. Even the main street was unpaved, narrow, and irregular, left rough like Church Walk, Northwich (a town in Cheshire, England). In some parts a rough parapet had been made, but not all round the town. The natives wandered up and down the street, dodging what little traffic came along, and no strict law appeared to be enforced. 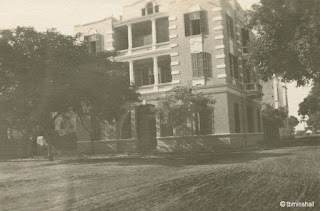 Some of the wealthy inhabitants of the town have built really handsome modern houses, away from the business quarters, and the architecture is very fine. A number of these lovely houses are spoiled by the dwellings of the lower classes, who have built their mud huts in some cases along the walls of these fine houses. 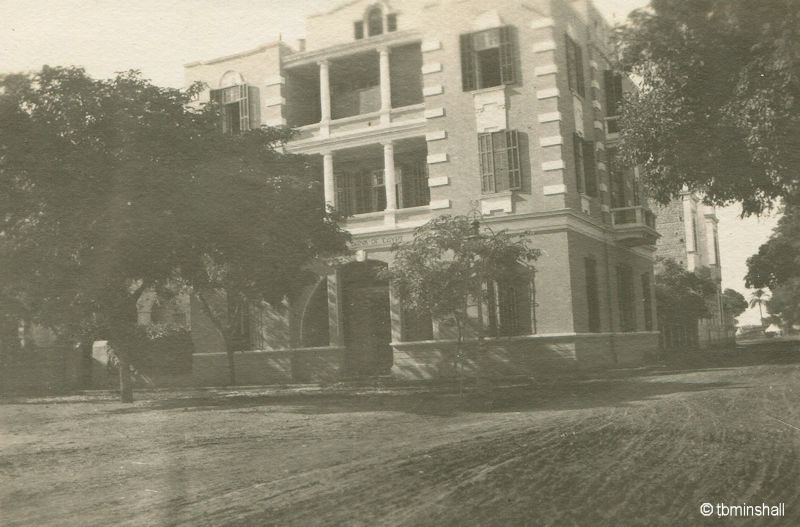 The outside work must have taken years to construct, lovely verandahs with vines growing over them, which protect the houses from the everlasting sun. The houses as a rule have flat roofs, the idea being to live and sleep on the top during the extremely hot weather. I have also seen the washing hung out to dry, which looked very funny, so high up. The appearance of some of the houses is spoiled by a shed of inferior material being constructed on the roof. I enquired for what purpose they were, and was informed they were built over a passage which went to the ground floor. Two door-ways are made on the north and west side in order to convey the cool breezes to the room below. Some of the houses have lovely gardens, as I described in one of my previous letters, while others do not trouble about a square yard. The sole idea of the Egyptians when building is to render their houses as private as possible, and I am told special attention is paid to the female apartments, the windows being made, so as not to overlook the other windows from houses round about. Some Egyptians have most elaborate doors to their main entrance, and decorate them in many ways. I have enclosed a sketch of one that was near to the Y.M.C.A. where the ladies were so kind. The windows as a rule are made of lattice work, which is very close, glass seldom being used, the idea being to screen the inside from persons passing. The dwellings of the lower classes, particularly of the peasants are of a very mean description, being mostly built of unbaked bricks cemented together with mud, and are mere hovels. The hovels, as a rule, have two rooms, (if they can be called rooms) for we would not think of allowing a horse to live in some of them. As a rule they build their rooms side by side, one very seldom sees these mud heaps two stories high. A number of peasants build mud pigeon houses all over the place which they sell to earn a living. A very old custom some natives keep, is to have paintings and sculptures on the fronts of their houses of flowers, boats trees, and camels etc, the reason for this being – a sign they had been on a pilgrimage to Mekkeh (Mecca). I cannot say what the inside of an Egyptian house is like, but I have noticed some rough articles outside. Their pottery is generally of a very rude kind and mostly consists of porous bottles and jars, in which they put the water from the Nile. From the palm tree branches and leaves they make seats, frames for beds, baskets, mats, brooms, and coops for poultry. The string and rope that is used is made from the fibre that grows at the bottom of the branches of the palm trees.